Memorial services for Dr. A. C. Rothermel, 82, will be held at 2 p. m. at St. Paul’s Reformed Church. The veteran educator died at his home on College Hill at 3:30 a, m. , October 5th and private funeral services were held Tuesday at 1 p. m. at the Stump Funeral Home, Fleetwood, the Rev. Paul E, Schmoyer, his pastor, officiating. Entombment was made in the mausoleum at Hope cemetery. Pastor Schmoyer will conduct the worship at the memorial services; a representative of the Lehigh Synod will speak; and the memorial address will be delivered by Dr. Charles E. Schaeffer, secretary emeritus of the Board of National Missions of the Evangelical Reformed Church, and life-long friend of the deceased. Dr. Rothermel gave 43 years of his life to his Alma Mater, the Keystone Normal School, now KSTC, serving eight years on the faculty and 35 as principal and president. More than 6,000 young people were graduated during his regime. Seven buildings were erected and a 129-acre farm was purchased and opened, the school plant, on his retirement was valued at $ 1,124,000. The noted educator held the record of being absent only twice in 35 years; served under State Superintends Schaeffer, Finnegan, Becht, Haas, Keith and Rule; and was responsible to 44 boards of trustees. Prior to his retirement in June, 1934, he was tendered a testimonial banquet, the participants including the presidents of 14 State Teachers colleges. A bronze tablet with a message by him, was unveiled. At the end of the school year he was succeeded by Dr. Q. A. W. Rohrbach, former head of the department of education principles and administration of the University of Pittsburgh. A native of Moselem, Richmond Township, he was born January 6,1864, a son of the late Lewis and Lydia [Rothermel] Rothermel. Following graduation from the local Normal, he taught school; in Richmond Township for three terms, and conducted the Polytechnic Institute at Gilbert’s Monroe county, on year, In the fall of 1887 he returned to the Normal School as a student, and a year later enrolled in Franklin and Marshall College, Lancaster, from which he was graduated with honors in 1891. The young graduate was than named teacher of natural science at the Normal; in 1893 was elected vice principal, and in 1899 was promoted to principal. 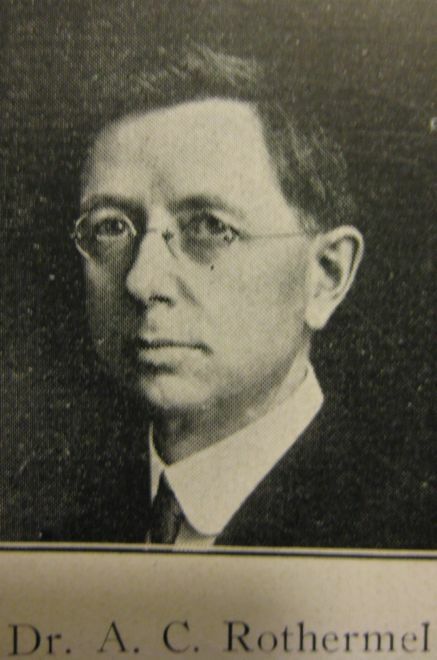 He continued in this capacity until 1929 when the Normal became Kutztown Teachers College, and he was elected president. In addition to charter membership in Kutztown Rotary, and elder-emeritus of St. Paul’s Reformed Church, and a member of the Torch Club of Reading, Dr. Rothermal belonged to Huguenot Lodge 277 F. and A.M. He was married on June 30, 1894, to Ada Spatz, who survives together with an adopted daughter, Mrs. Ruth Allen, Philadelphia; a brother, Dr. Lewis R. Rothermel, Shilllington; three sisters: Mrs. Harvey Rothermel, , Fleetwood, R. 2, and Mrs. Charles Scholl and Mrs. Emory Stewart, Reading. Please share your memories of Amos.